Tulips are one of Neill's favourite spring flowers. To explain why, he shares with us his sourcing visits to Holland and how he brings back the most beautiful Tulips to Belgravia. 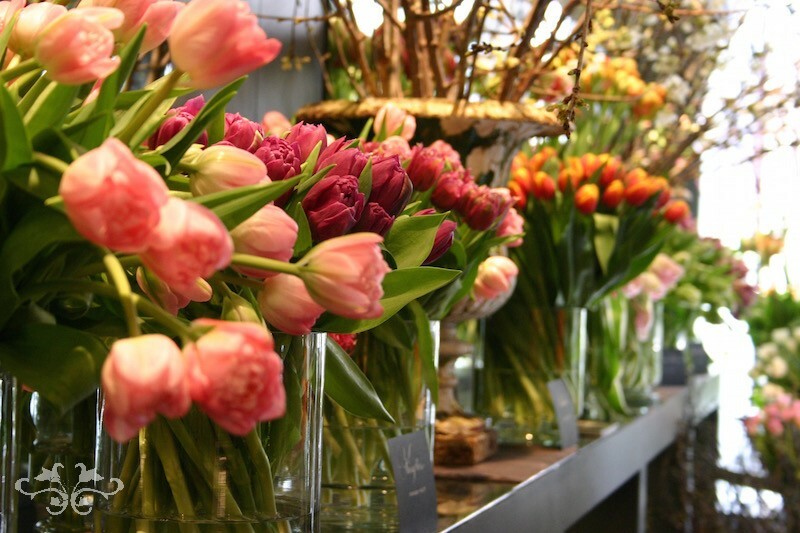 From inspirations at the famed Keukenhof Gardens to insights from the top breeders, Neill shows us a extraordinary range of Garden and Cut-Tulips, many of which are available at the Belgravia boutique. Neill Strain sourcing spring flowers in Holland includes a visit to the Tulip bulb fields. I am often asked "what is your favourite flower?" And I reply that I don't have one because it depends on the season or what I'm working on. But, today I can securely say I am loving Tulips! They are so varied; they are so cheerful and in springtime, whether you see them in the garden or in my Belgravia boutique, it's hard to match their pure beauty. Every spring I go to Holland to source the newest, rarest and most beautiful spring flowers from our growers, to bring back to Belgravia an assortment that is exciting and irresistible. One of the most inspirational places to visit is the incredible Keukenhof Gardens in Lisse. Created in the 15th century and redesigned in 1857, the gardens cover more than 200 hectares and showcase the floriculture of the Dutch spring flowering bulb growers. 7 million flowering bulbs from about 100 Dutch companies are planted each year in breathtaking garden designs. Daffodils, Narcissi, Muscari, Fritillaria make stunning displays with the main focus on Tulips. The history of Tulips is long and exciting. Originating in Turkey, the bulbs were developed in Holland in the 17th century when prices for the bulbs reached extraordinary levels and then suddenly collapsed creating the world's first recorded speculative financial bubble. At the peak of "Tulipmania" bulbs sold for more than 10 times the annual income of a skilled craftsman. Centuries ago, all Tulips were classified as botanical species "Garden Tulips" comprising 3 families: Kaufmanniana, Fosteriana and Greigii. Here is an example of an old Garden Tulip from the family Greigii, named Albion Star, growing in the Keukenhof Gardens. Garden Tulips are grown for their bulbs in south Holland where the good soil makes attractive, soft-skinned bulbs. Other old varieties, such as these, are preserved in the Hortus Bluborum Gardens in north Holland. Run by a foundation, this unique garden has 4,000 spring bulbs including Tulips dating back to the 16th century such as this "Duc van Tol Red and Yellow" variety (below) from 1595. Like the Koekenhof, you can visit from March to May to enjoy this exceptional display of spring flowers demonstrating the evolution of spring flowers over the past 5 centuries. Due to the popularity of Garden Tulips in the late 18th century, bulb breeders in the Netherlands and France started to create new varieties, Modern Hybrids, by cross-breeding with traditional varieties from Turkey and other countries - making the short stems longer with new and mixed colours and shapes. It wasn't until the 1920s that there was any interest in Tulips as a Cut Flower but as this new trend grew, so did the number of varieties and many new families of Tulips were created. Cut Tulips grow in northern Holland where the clay soils require them to search deep for food. This creates a stronger flower but less attractive bulb. Originally named by Darwin, the 12 different types of Cut Tulips that still exist today are: Single Early, Double Early, Triumph (triumphant as they can grow both outdoors and in glasshouses), Darwin (short, strong stems), Single Late, Double Late, Lily, Fringed, Viridiflora (with green shades on the petals), Rembrandt (with coloured stripes like the old varieties), Parrot and Picture (crown). There are also the long-stemmed French Tulips. Each of these "families" have different requirements to grow successfully; for example, a Double Tulip needs more time on the stem to make its additional petals. These Cut Tulips differ from Garden Tulips because they can be grown in the glasshouses (not outdoors) where temperature, watering and conditions can be controlled. 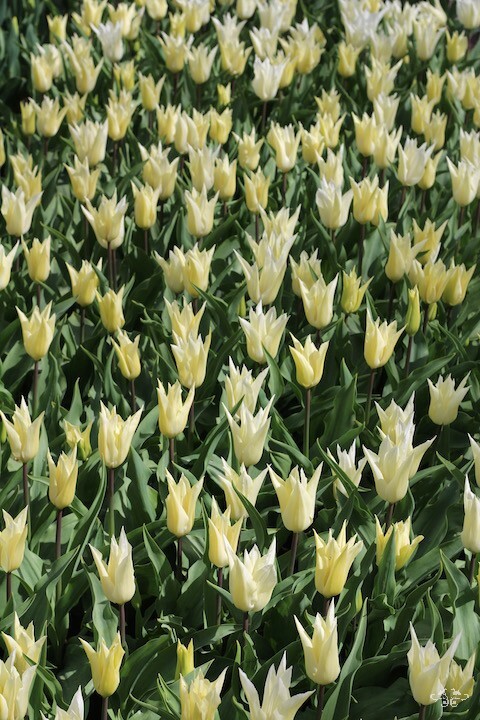 While Garden Tulips will not tolerate glasshouse conditions, the Cut Tulip Hybrids thrive and this allows the breeders to manipulate the seasonal temperatures, give different treatments and create more and more exciting new varieties. Developments include crafting new breeds; turning natural deformations into new varieties; the introduction of early flowering Tulips (since the 1960s); discovery in the 1990s that bulbs can be re-used to produce more Tulips after the first flowering if specially treated. Formerly the bulbs were discarded. Now, with distinct temperature controls, the bulbs can continue to create new flowers and this has dramatically increased production. Tulips growing with Muscari and Hyacinths at the Keukenhof Gardens; a marriage that also works well in floral designs. Tulip breeders are currently introducing some very unusual looking varieties. These are mostly derived from inexplicable "accidents of nature." These new Tulips are grown outdoors, which makes them longer stemmed and stronger. One curiousity is that the Tulip "Gavota" is said to be derived from deformations that were caused by nuclear contamination after the Chernobyl disaster in Russia, April 1986. Another, during World War II and the "hunger winter," the Dutch survived by eating their Tulip bulbs in soups (cooked like an onion). Many of these amazing Cut Tulips are on display at our boutique. I love them all. 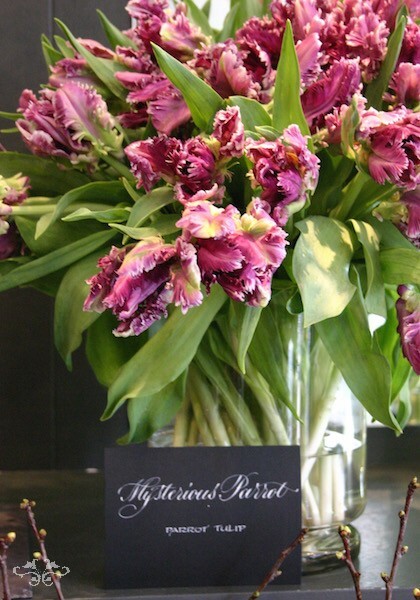 The growers know that the most special, most unique Tulips must be sent to Belgravia for us. If this blog post has inspired you, then please come and visit us and enjoy the Tulips and all our fabulous spring flowers now that you've learnt so much about them!